Relief From Dry Air Fancii personal humidifier quietly moistens the air in small spaces, providing the ideal moisture balance to help you breathe better. Simple in design but powerful in function and performance, this portable unit utilizes individual water bottles (sold separately) to improve the air quality and moisture content in the immediate vicinity while combating the harsh effects of dry air. Ideal for your home, office, car, or travel. Whisper-Quiet Operation Acoustic engineering, with sound level less than 15 db, ensures you always get a peaceful and comfortable night sleep. Cordless Design This unit is powered by 3 AA batteries, that can last up to 18 hours (depending on the battery). It can also be plugged in to a USB source, such as laptop, power banks, or wall adapter with the included cable. Timer Function Set a precise time to automatically shut-off the device. Choose between 2, 4, and 6 hours of operation. The unit has a preset auto shut-off of 8 hours as well. Ultimate Portability The device is small and lightweight. Its compact size and wireless design allows you to take it wherever you go. It can easily fit in purses, backpacks, and suitcases. Highlights: • PureMist Moisture Technology • Whisper Quiet Operation • Timer Function (2,4,6 hours) • Auto Shut-Off (8 hours) • Battery Operated (3 AA not included) • USB Powered (cable included) • 3 WX2 Filters (Change every 1-2 months) • Wireless (No Power Cords needed) MUST READ - Not all bottles work! 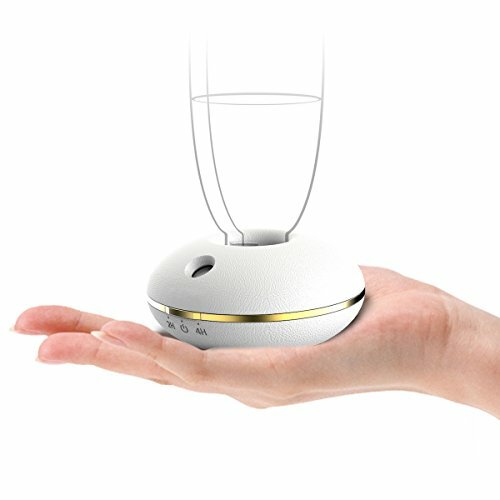 This humidifier will ONLY work with bottles with standard sized necks (low profile necks won't work). - Use 16 to 20 oz Dasani, Aquafina, Smartwater, Fiji, Evian, or Soda bottles. ✔ Backed by a 100% RISK FREE Money Back Guarantee! If you are not satisfied with our humidifier, we will give you a full refund.